FIU rolled out its first-ever faculty and staff fundraising campaign, “Ignite,” with a rousing call to action from founding faculty member Steve Fain. Ignite is part of FIU’s larger $750 million fundraising campaign led by University Advancement. Through Ignite, the university seeks to demonstrate to the community that the faculty and staff believe in FIU enough to support it financially. The goal is 100 percent participation from FIU’s 8,000 full- and part-time employees. Fain outlined the four tenets of the campaign: It will be fun for all. Everyone who participates will be recognized. Everyone will be respected. The campaign will educate all on the importance of FIU and why giving back is important. Employees are encouraged to donate to the area of the university they care about most. A new Ignite website lists projects that employees can support, and employees are encouraged to submit new projects for consideration. After one year, the Ignite site will be used for fundraising in the community. As of the morning of the campaign’s launch, 500 employees had pledged $508,000 through the Ignite campaign. Of those, 45 are part of the Leadership Circle, indicating that they had made a five-year pledge to FIU. “We can’t get 100 percent participation if we don’t get you,” Fain said. Internal fundraising campaigns are common at major universities around the country, but one has never been launched at FIU. FIU President Mark B. Rosenberg offered an explanation. 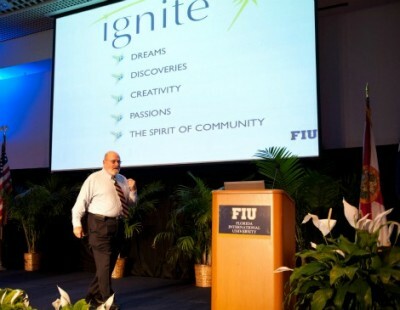 Ignite creativity, innovation, discovery and learning through the FIU Ignite Campaign!